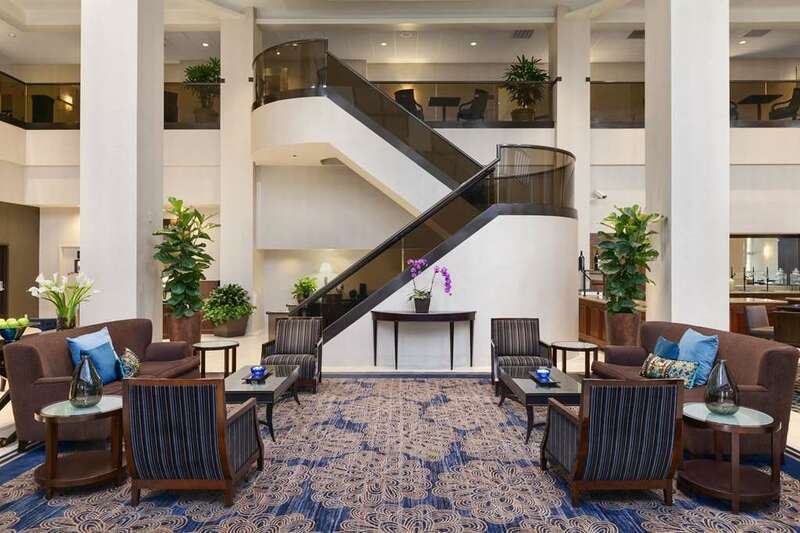 This hotel is 100pct nonsmoking Check-in to the stylishly updated Embassy Suites Santa Clara and you will be ideally positioned to make the most of your time in the heart of California*s Silicon Valley. Enjoy the proximity to the Santa Clara Convention Center Levi*s Stadium Great America Theme Park and being just minutes from downtown San Jose the San Jose Airport /SJC/ and SAP Center. Spread out in a newly redesigned two-room or studio suite with two large HDTVs WiFi and a separate living area and bedroom. Wake up to a free made-to-order breakfast each day and enjoy free drinks and snacks at the Evening Reception*. Indulge in casual dining at our Valley Plaza restaurant featuring a California-inspired menu of American favorites for dinner nightly. Whether conducting business keeping up with a fitness routine or looking to spend quality time with your family our refurbished Embassy Suites hotel is here to make the most of your stay by offering the services you need the amenities you expect and the extras you deserve. *Service of alcohol subject to state and local laws. Must be of legal drinking age.